There are various kurumAs in name but all belong to the same type. 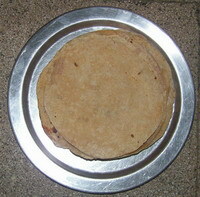 It is nothing but a sort of kUTTu with coconut and spices added differently. Cut the vegetables after washing into small cubes and pressure cook including the green peas except capsicum. Grind the coconut shreds, poppy seeds, aniseeds, cashews, ginger, green chillies and garlic adding a little water into coarse paste. Take oil in a kaDAi and fry the cinnamon pieces, clove and cardamom seeds. Now, sauté onion, tomato and capsicum pieces well for 5 minutes. Add the ground paste to this and sauté again for 5 minutes. Add the cooked vegetables, salt, sugar, turmeric powder, chilli powder (if required) and water to boil for 5 minutes. Remove when the contents are not very thick since the masAlAs will make it thicker when cooled. Serve hot. Goes well with chapatti, parAtta and pUri. You can use it with bread toast as well as stuffed parAtta. 1. For three persons, you need not more than 2 cups of all the above vegetables when cut. More vegetables means more clumsy and the kurumA becoming extremely thicker like curry instead of gravy. Do not use beet root as its colour will spoil the appearance. 2. If cauliflower is used, just boil it to retain its shape and colour and do not pressure cook it like capsicum. 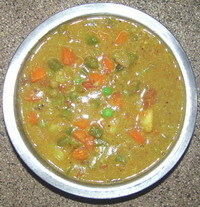 This entry was posted on May 10, 2011 at 12:02 am and is filed under PUri & Alu Dum with tags aniseed, beans, bread toast, capsicum, cardamom, carrot, cashew, cauli flower, chapatti, Chettinad KurumA, cinnamon, clove, fennel seed, garlic, ginger, grated coconut, green chillies, green peas, KurumA, Navaratan KurumA, onion, paratta, poppy seeds, potato, puri, red chilli powder, refined oil, roasted split gram dAl, salt, stuffed parAttA, sugar, tomato, turmeric powder. You can follow any responses to this entry through the RSS 2.0 feed. Both comments and pings are currently closed.